Belvoir Players Studio is situated in the Belvoir estate in Belfast, Northern Ireland where the Belvoir Players rehearse and perform. This facility provides an excellent venue for a large variety of activities and is home to a number of other groups including the Belfast branch of the U3A, the Studio Symphony Orchestra, and many others. The studio’s main hall can seat up to 200 people and the seating bank can be retracted to allow for use of a much larger space during rehearsals for large productions. The design of the hall allows for it to be adapted to suit the particular needs of the event that is coming in, meaning that the studio can be used for many events ranging from theatre shows to parties to conferences. The studio also has a smaller hall used for meetings and rehearsal’s, the addition of a partition means the room can be divided to create two separate spaces for more groups to use the building at any one time. The multipurpose nature of the minor hall means that it can be used for lots of different purposes ranging from meetings to hosting audiences before Northern Ireland premieres of shows. 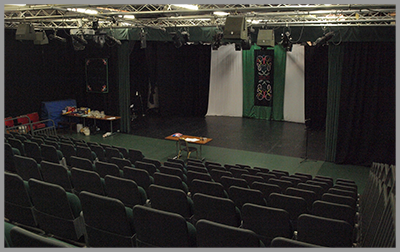 The minor hall can also be used in conjunction with the green room (pictured right) to provide further changing facilities for large groups that use the building for large productions. The green room and minor hall both have a paging system installed allowing the casts of productions to hear what is happening on the stage. The buildings paging system is feed from the main mixing console meaning that visiting companies can choose to either use the installed paging mic or if the company wishes they can send a custom mix of any of the consoles channel to the paging system. 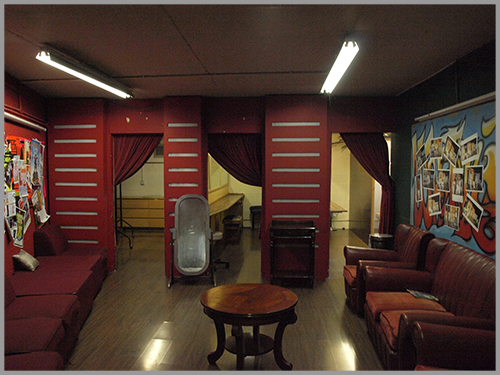 The green room has three changing rooms which can each accommodate about four people. The green room has toilet facilities located in the right-hand dressing room. 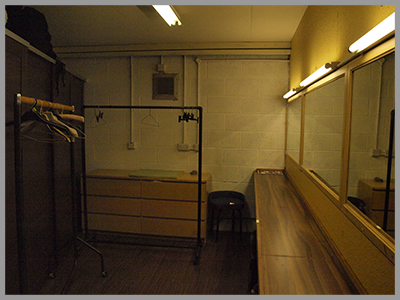 The three changing rooms all have three mirrors installed as well as a shelf which can be used to set makeup, props, and costumes on. There is all so a costume rail located in each room meaning that costumes can be hung up neatly when not in use. The studio has hundreds of costumes stored in the buildings costumes department which have all been used on numerous productions by many different organisations. Costumes can be hired from the group, you can get more information on this by speaking to the wardrobe mistress. The building has a large scene dock for loading in sets for shows as well as storing large set pieces during large theatre and musical productions which can double up as a workshop for building sets. The workshop doubles up as a store for all of the Belvoir Players sets. The workshop is always a hive of activity with set’s constantly being built for up and coming shows as well as a number of sets being built for other companies. The group has a large collection of props and set which a number of groups borrow and use on occasion, if you want to find out more information don’t hesitate to contact the studio. The buildings control tower has the latest in theatre sound and lighting technology, with a lighting desk capable of controlling 2048 individual channels across four DMX universes. The buildings sound system is capable of controlling 32 inputs and outputting to up to 19 different sources, as well as having a built-in four channel matrix. The studio has recently invested some new equipment meaning that we now have 8 L.E.D power cans capable of creating multiple different colour washes. We have also recently invested in 4 moving head lights meaning that we can now offer a more dynamic rig to visiting companies. All 12 of these fixtures can be controlled individually to create a multitude of different effects for any type of production. 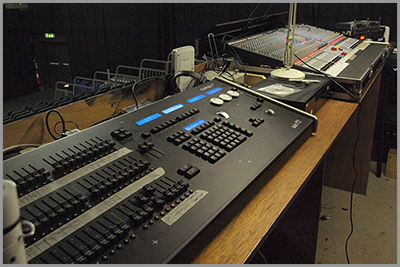 The studio has a small stock of sound equipment which can be hired for use on productions within the building upon request during the booking process. This equipment ranges from digital radio microphones to vocal monitors. There is also a number of data projectors which can be used for anything from scenic projection for shows to slideshow projection for conferences. If you want anymore information on any of the above information or wish to enquire about booking the building don’t hesitate to contact the studio on 02890 491210. All content © Belvoir Players. All rights reserved.